The Red Bulls also 12-2-2 at home, tying a franchise record for home wins in a season with one game remaining at Red Bull Arena, on Sunday, October 16 vs. Columbus. 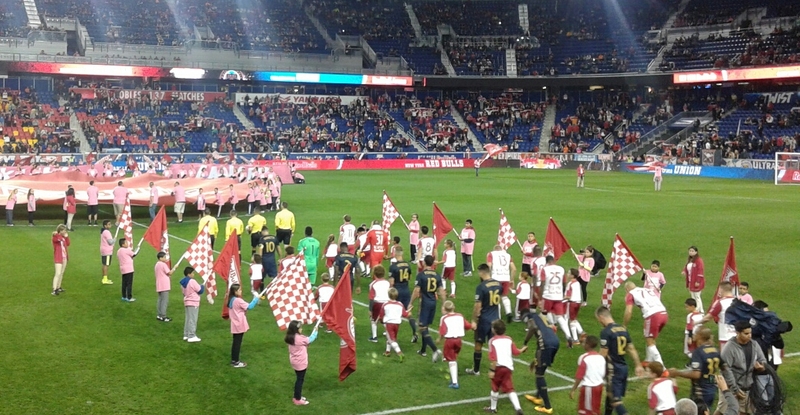 The Red Bulls set the record last season. Twelve home wins is also the most of any team in MLS this year, and they are one of just three teams in the league with double-digit wins at home, and the only team in the Eastern Conference. 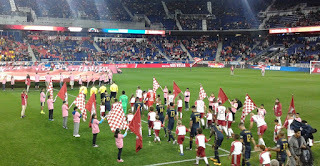 The Red Bulls and Union taking the field. Photo by Jason Schott. Philadelphia opened up the scoring with a goal from Fabian Herbers in the 14th minute. Herbers took a quick shot on the left side of the box and slipped it by Red Bulls goaltender Luis Riobles. It would stay that way until the 44th minute when the Red Bulls tied it on a goal from Sacha Kljestan on an opportunity inside the box. Kljestan played a short corner to Felipe, and then worked himself into space to direct a low shot by Philadelphia goaltender Andre Blake. Right out of the gate in the second half, Bradley Wright-Phillips got a long pass from Dax McCarty, and sped by two Philadelphia defenders to score and make it 2-1 Red Bulls. This was his 21st of the season, tied with NYCFC's David Villa for most in the MLS, and Wright-Phillips owns the tie-breaker with five assists. Wright-Phillips said of his goal, "I just wanted to get my foot through it, I know that Blake is a very good goal keeper so I was thinking about keeping it low and just getting decent contact. It was a great ball from Dax, as you see I didn't need a first touch, because of the quality of the ball. I just tried to keep it low." Red Bulls head coach Jesse Marsch said of Wright-Phillips, " Well, what a great goal. I mean, talk about a confident take. I mean, he just ran after that. I have the perfect angle for it, and I'm thinking to myself, just nice and easy (laughing). I mean, he absolutely buries it. So, I mean, his form, his confidence, and I'll say, so much of it stems from his leadership. He's stepped up his leadership in such a big way. The times he chooses to speak, the things he says, the commitment he has to this group, I mean, has led us. It's led us in so many ways. It's obviously led to him having clarity on the field and confidence. So he could have had another, but he's been fantastic." McCarty said of Wright-Phillips' leadership, "Brad's a humble guy and a guy that's never going to be the loudest voice in the locker room, he likes to do his talking on the field but Jesse has challenged him to be more vocal, and be a guy that steps up in tough moments as more of a vocal leader. People listen to him, people follow him. He's one of the best players this club has ever seen and when you have a guy with that pedigree and that ability to score goals and win games for us, people listen to him." Philadelphia tied it in the 55th minute when Chris Pontius just got a header past Robles and inside the post on the right side. In the 66th minute, Kljestan had a free kick and put it in the box, where it found McCarty, who headed it home for his thirdgoal of the year to make it 3-2 Red Bulls. McCarty also had two headed goals in the 7-0 win over New York City FC on May 21. The Red Bulls captain also was awarded assists on the first two goals of the night. McCarty said of his goal, "I think Brian Carroll was marking me and I started in an offside position. I think in his head he was thinking I was going to run across the line towards the near post. Honestly Sacha told me before the set piece, get free and ill look for you. I think he just started back post and luckily I faded instead of running across the line. Its one of those where you hope the line drops and you find yourself onside. It was very similar to the goal I scored last year against D.C. in the playoffs." Marsch said of how important it is for McCarty to focus on offense in addition to his responsibility to stop the attack from the opposition, "Well, I said when we were giving up the two-goal leads, I thought that Dax would be a very important element, because his experience, his savviness in the middle of the field, his understanding of what games are like, his understanding of what each moment of the game requires is one of the highest levels of any player in that position in the league and potentially any player in the league. "So, listen, I want to also talk about Sean Davis and what he's meant to this team and how he's helped us get to this point of where we are. But when you have a player like Dax who is our captain, our leader, our experienced guy on the field, our lynchpin, our anchor, right? He's incredibly important, and he's going to be the piece that helps us ultimately get over the hump and find a way to really push to go after the championship." Wright-Phillips had a chance at another goal when he almost went five-hole in the 84th minute, and a couple minutes later, sent a rocket over the crossbar. Marsch said of how gratifying it was to see his team fight back like that, "Yeah, first, I think Philly's a good team. They came in here, they played hard. They made it hard on us, kept coming at us. I thought overall it was a really good game. A good game for the league and a good game to watch, and a good game to be a part of. "For us, I think to get smacked in the mouth twice, right? I mean, to go down and then even when it seemed under control at 2-1, and for them to deliver another punch and for us to get stronger, right? I think we got stronger as the game went on, we got better. We were more committed, more focused, more concentrated, and then it leads to us eventually getting the win. "So I told them after the game that for two years we've talked so much about getting better when things got tougher. And I think watching that tonight, I was really impressed with our group. I was really impressed with their commitment, with their sharpness, with their competitive will, with their heart and character, so much in there that we've been trying to be about for two years. So I think this group's coming together in a good way." Wright-Phillips said of the Red Bulls getting "punched in the mouth" and responding, "It was a great reaction, after the game when it's all said and done I'm glad we went a goal down, because it's good to see for ourselves how we, getting to playoff time now, to see the character of the team. As soon as they score we play better, it's almost that we needed that. You don't want to depend on those things obviously but we reacted well." The Red Bulls are off next week, along with the rest of MLS for the FIFA International window. They return home to host Columbus Crew SC on Sunday, October 16 in the home regular season finale, and close the regular season on the road at Philadelphia on October 23.